Pudget: Losing Weight On a Budget! : The Best Breakfast Ever!!! I really think I had the best breakfast I have ever had and it was healthy! It is called "jammed with cheese stuffed french toast". 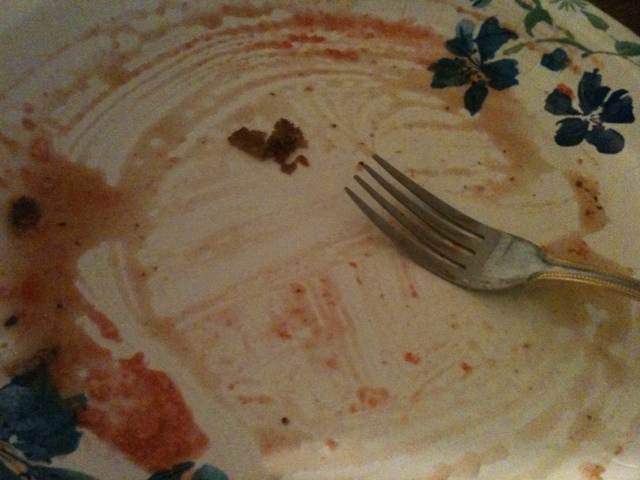 It was so yummy that I forgot to take a picture of it. As you can tell by the picture I thoroughly enjoyed it. :). Now I am stuffed and ready to head off to work. I am working late because we have a Halloween parade tonight. That meant I got to spend a little time with my little one this morning. Mix egg sub. W/ cinnamon and vanilla. Transfer to a plate. Lay bread on a clean dry surface and spread half of cheese on each side. Place preserves on one slice over cheese and place together like a sandwich. Bring skillet sprayed with cooking spray to med. Heat. Add butter and allow to coat pan. Evenly coat both sides of bread and edges with egg mixture. You won't use all of mixture. Place sandwich in skillet and cook for 2-4 min. On each side until golden brown.